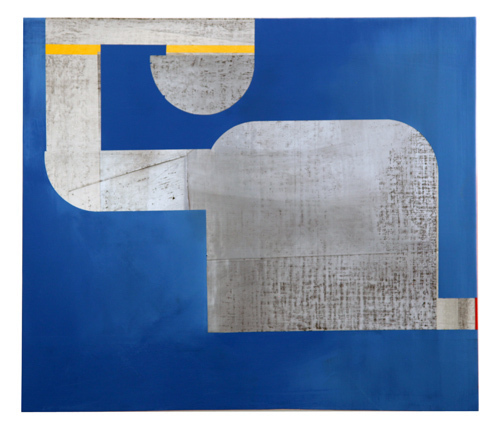 James Busby, Tunnel Vision, 2012, gesso, graphite, oil, and acrylic on linen, 18 x 21”. James Busby’s working materials—from gesso on MDF and spray paint on polycast acrylic to ink on yupo paper and his recent panels made with oil, acrylic, and graphite—are as varied as his method is consistent: Over the past decade, he has been steadfast in his investigation of plasticity, pictorial space, and the playful tussle between them. The pokerfaced, demure white of his earlier output has ceded in this exhibition to a vibrant play of color, which is by turns striped, striated, and laid in rectilinear blocks. Despite this shift, geometry still takes pride of place in Busby’s paintings, and if it now crackles instead of whispers, it is no less scrupulous. The orange and green planes of Cornerslot (all works 2012), in which the wide expanse of color is intersected by a few carefully timed angles, calls to mind some of Richard Diebenkorn’s “Ocean Park” series, 1967–88. Busby’s burnished surfaces, though, eschew any painterly effects. Or rather, they become sublimated into smooth, slick facades, which in many instances bear the shimmer of rubbed graphite. Some of the works resemble odd, space-age carapaces, hermetic objects in their own right. With their Day-Glo patterning, a few of the paintings also walk the line between the decorative and the kitsch. They recall Frank Stella’s attendant concern with the quirks of pictorial support itself. Also like Stella, Busby keeps an eye trained on the legacy of Constructivism, and its earnest attention to facture. Even more striking is the spare pictorial economy of Tunnel Vision, in which a single white form wends its corpulent, tubular way from the upper left edge of the canvas to the right side near the bottom.